Renesas Electronics Corporation, a premier supplier of advanced semiconductor solutions, announced an update to its “Embedded Target for RH850 Multicore” model-based development environment for multicore microcontrollers (MCUs) for automotive control applications. 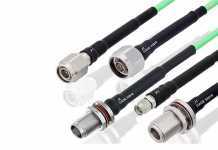 The update supports development of systems with multirate control (multiple control periods), which is now common in systems such as engine and body control systems. This model-based development environment has become practical even in software development scenarios for multicore MCUs, and can reduce the increasingly complex software development burdens especially in control system development of self-driving cars. Renesas’ earlier RH850 multicore model-based development environment automatically allocated software to the multiple cores and although verifying performance was possible, in complex systems that included multirate control, it was necessary to implement everything manually, including the RTOS and device drivers. Now, to meet the ever-increasing requirements for engine and vehicle performance, and at the same time shorten product development time, by making this development environment support multirate control, it is possible to directly generate the multicore software code from the multirate control model. This has made it possible to evaluate the execution performance in simulation. Not only does this allow execution performance to be estimated from the earliest stages of software development, this also makes it easy to feed back the verification results into the model itself. This enables the completeness of the system development to be improved early on in the process, and the burden of developing the ever-larger scale, and increasingly complex, software systems can be significantly reduced. Renesas is accelerating the practical utility of model-based development environments in software development for multicore processors and is leading the evolution of green electric vehicles as proposed in the Renesas autonomy concept. Control functions development requires multirate control, such as intake/exhaust period in engine control, the period of fuel injection and ignition, and the period with which the car’s status is verified. These are all different periods. 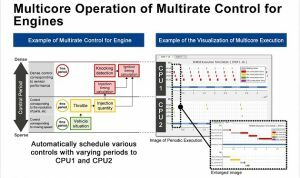 By applying the technology that generates RH850 multicore code from the Simulink control mode to multirate control, it has become possible to directly generate multicore code, even from models that include multiple periods, such as engine control. Renesas also provides as an option for the Integrated Development Environment CS+ for the RH850, a cycle precision simulator that can measure time with a precision on par with that of actual systems. By using this option, it is possible to estimate the execution performance of a model of the multicore MCU at the early stages of software development. 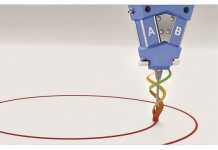 This can significantly reduce the software development period. The JMAAB (Japan MBD Automotive Advisory Board), an organization that promotes model-based development for automotive control systems, recommends several control models from the JMAAB Control Modeling Guidelines. Of those, Renesas is providing in this update the Simulink Scheduler Block, which conforms to type (alpha) which provides a scheduler layer in the upper layer. This makes it possible to follow the multirate single-task method without an OS, express the core specifications and synchronization in the Simulink model, and automatically generate multicore code for the RH850 to implement deterministic operations. The updated model-based development environment is planned to support Renesas’ RH850/P1H-C MCU that includes two cores by this fall, and also support for the RH850/E2x Series of MCUs that include up to six cores is in the planning. 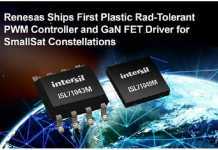 In addition, Renesas plans to deploy this development environment to the entire Renesas autonomy Platform, including the “R-Car” Family of SoCs. 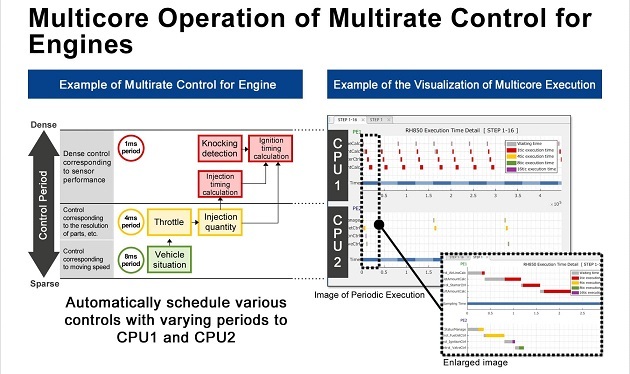 Renesas is also continuing to work to further improve the efficiency of model-based software development, including model-based parallelization tools from partner companies and strengthening of related multirate control support execution performance estimation including the operating system. Moving forward, Renesas plans to apply the model-based design expertise fostered in its automotive development efforts in the continually growing RX Family in the industrial area which is seeing continued increases in both complexity and scale.